When I opened my February 2011 copy of Food & Wine magazine, an unusual picture caught my eye. A band of adults and kids, all of them clad in bright parkas and clutching broomsticks, were captured mid-sprint in a game of broomball on an ice-covered lake. The scene looked like a modern Norman Rockwell painting. It also looked vaguely familiar. As I turned to the article that went along with the photo, I realized it looked familiar because it was familiar. The article featured Madison’s own chef Tory Miller, of L’Etoile and Graze restaurants, and the photo was taken on Lake Mendota. As pointed out in the article, which was authored by Madison writer Louisa Kamps, Chef Tory is committed to cooking with local, seasonal ingredients even in the white freeze of a Wisconsin winter. 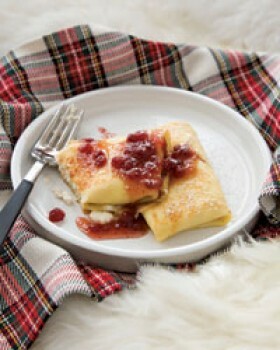 It’s a task that involves a lot of creativity, as can be seen in this recipe for ricotta blintzes. I think this dish would be delicious on a cold weekend morning with a steaming mug of coffee made with beans from local roaster Just Coffee. From Food & Wine magazine, February 2011. Recipe by Tory Miller. Photo by Michael Turek. In a bowl, whisk the flour, baking powder and a pinch of salt. In another bowl, whisk the eggs, milk and sugar. Whisk the flour and eggs together; whisk in the butter. Cover and let stand for 1 hour. In another bowl, mix together the ricotta, sugar and cinnamon. In a saucepan, simmer the jam and maple syrup over moderate heat until slightly reduced, 5 minutes. Heat two 8-inch nonstick skillets. Spray with vegetable oil spray and add 2 tablespoons of batter to each. Swirl the skillets to distribute the batter and cook over moderate heat until golden brown on the bottom, 1 minute. Flip the crêpes and cook until brown spots appear on the bottom. Transfer the crêpes to a cookie sheet. Repeat with the remaining batter to make 20 crêpes. Preheat the oven to 350°. Line another cookie sheet with parchment. On a work surface, spread 2 rounded tablespoons of the filling in the center of each crêpe. Fold each crêpe to form a rectangular packet. Arrange the blintzes on the cookie sheet, seams down. Bake until hot. Rewarm the syrup. Place 2 blintzes on each plate. Dust with confectioners’ sugar, pour the warm syrup over the blintzes and serve.